I did some tries for a first simple walk. Lots of try and error. But at least I preferred the drag tool to eliminate slipping. Binding the drag tool floor to the object caused the skeleton to walk out of the mesh. Binding the drag tool to the level which contains the skeleton and the mesh was a good solution. After I bound the level to floor via drag tool I did each 5 frames a keyframe and animated the skeleton grabbing the spine at point 0 and moved it forward. After that I tried to suit the legs and then the upper body. The first tries didn't looked very good. Now here is a try I'm a bit satisfied already though animators will for sure notice some flaws. I'll appreciate any input. 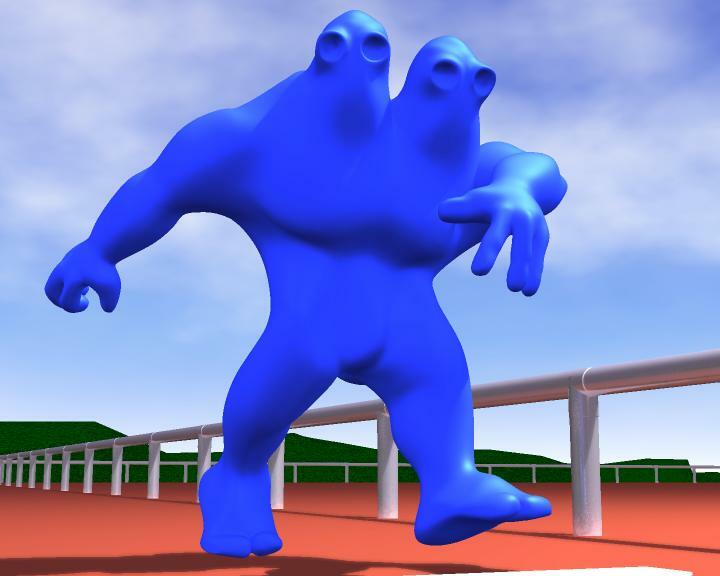 it's lots of fun animating the blue guy. Now he also greets the audience. I've done a first camera morphing but this has to be more subtle next time. Also the guy needs a bit more work at the walk sequence. I think I was able to improve the walk and also the camera morphing. That's it for this first test sequence. Might be the intro of the final long-jump-animation. Hi Boris, yes it looks very good. How did you anchor the foot on the ground with foot steps ? I didn't used the footsteps tool. I never got a character walking with it So I tried the drag tool which was introduced in Version 5. The drag tool simulates the gravity of the floor. If you bind the character and its skeleton via drag tool to the floor the character and skeleton will be sort of anchored to the floor because of the gravity. That doesn't eliminate automatically any slipping but it assists it very much if you setup the walk quite carefully. Setting up the keyframes I use 5 frames steps. 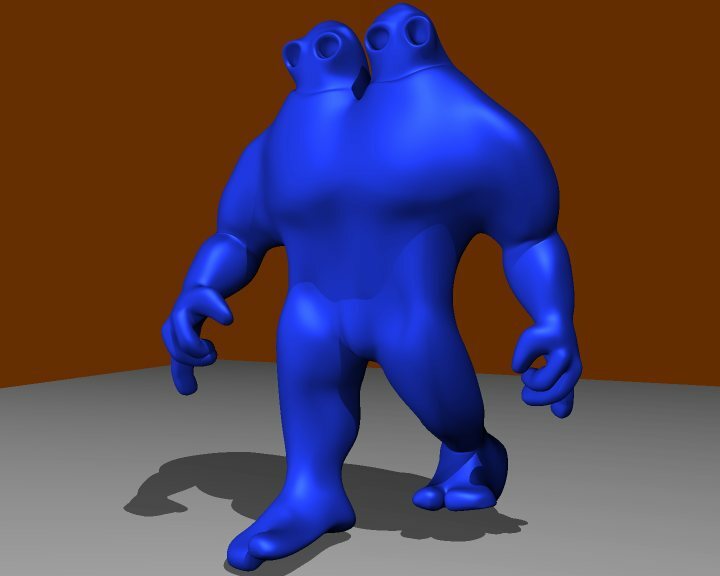 I grab the spine of the blue guy and move it forward till it starts to pull the legs after it a bit. After this I take the walking leg and put it to a new suiting position. The standing leg shouldn't be moved at all at the feet. Very helpfull is here to work with gridsnapping and grid to control that the foot stays where it is. Some movement in the knee of the standing leg makes it look less stiff. I hope that I was able to explain this right with my poor english. If not ... please tell me and I'll make a little animation showing how I setup the keyframes. body (both the skeleton and the mesh). The blueguy tries his first "jump". I'll render this animation again with the next beta of DynAtomic (wobbling) and then I'll add an end. It was the first time I really did a walksequence. I think the drag tool gives you a real good base to make interesting walks of all sorts without slipping and penetrating the floor. One has to get a feeling for it.